Have you ever had the experience of getting a gift from somebody you barely know that so perfectly fits you that you wonder how people you have known your whole life find it so difficult to do? Well once such occasion came when my future in-laws (yea, i know) bought me an old wooden shoe shine kit after meeting me just once. It is just a simple wooden box with hinges and a stand for your shoe to rest on while polishing it but it has stayed with me for almost 15 years and is one of my most prized possessions. Even after taking a spill down the stairs during one of our many moves, breaking the lid and splitting the shoe rest, it still holds a highly coveted place in my very small closet. …the art of shining your own shoes is a discipline unto oneself and a rare pleasure that has all but been lost to the everyman. If you don’t already have shoe shine supplies, then you will have to invest in a few things up front, but altogether, it’s probably less than you spent last week on coffee so really, it’s up to you to decide what you spend your money on. Don’t go out and buy an already assembled shoe shine kit unless you are willing to drop some cash on a quality one. The $6 kits at wal-mart are hardly worth the plastic zipper pouch they come in. Instead, look around and buy the individual items or go to a shoe repair shop and invest. Step One: The first step in shining your shoes is getting them clean. Polish will never smooth over dust so take out your laces, lather up some saddle soap and get them clean. Before moving forward, allow them to dry fully. Once your shoes are dry, lay out a sheet of newspaper to keep your project contained, and then you can start to apply the polish. There are many opinions on how to do this, but like most things I do, I like to keep it simple. Wearing your work glove, rub your finger in circular motions in your tin of polish. You don’t want globs, but you do want to soften up the polish so that it goes on smoothly. Now spread it on your shoe, using circular motions again, starting with the toe and moving backwards. Make sure that you get a good even coat on the whole shoe without getting it so thick that it has any raised texture. When you are done, the whole shoe should have a smooth but dull finish. I like to take a soft toothbrush and lightly dab it in the polish to get the detail areas of the shoe. (i.e. the seams, along the sole, and around the lace holes.) Once the first shoe is done, set it aside to dry and repeat the process on the second one. Step Two:When both shoes are prepped, take the first one (presumably dry by now) and begin lightly buffing it with your horsehair brush. As the shine starts to emerge you can become more vigorous with your buffing. Next, set it aside and repeat on the second shoe. At this point, your own personal taste will determine the next step. For most, two coats are enough. But for some, three coats is the minimum. If you like, you can start again with the polish application, repeating all the steps as many times as you like. 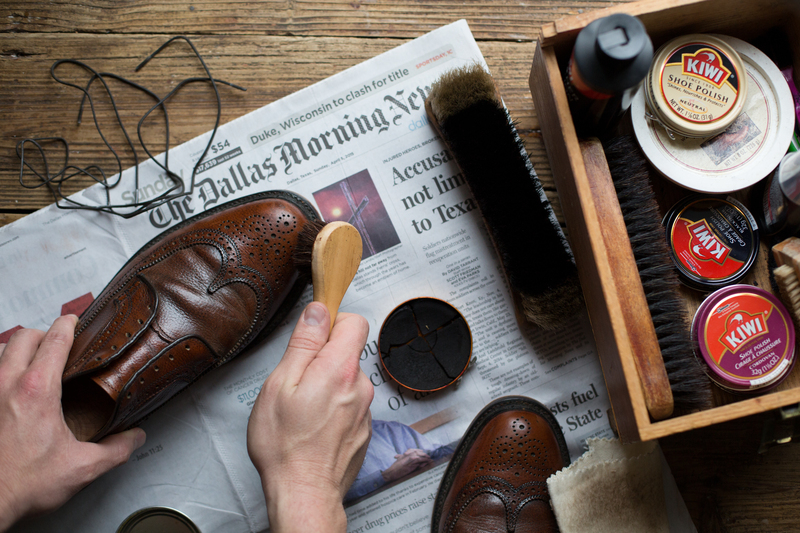 When you are finished, the final step is to buff your polish to a high shine using your shoe shine cloth. This is a subtle but valuable step in making your shine even and durable and you can’t over buff your shoe. For the truly die-hard polisher, a light mist of water before the final buffing will bring the shine up to mirror like perfection, but I prefer a little less shine than that. When you are satisfied with your shine, lace your shoes back up and wear them with pride. You’ll be surprised by how many people notice.